By night though, the square transforms completely. After the sun goes down, the weather becomes more tolerable. Dozens of food vendors pop up and set up their food stands for the night. Fires start and smoke starts to rise from the general area, giving the air the scent of grilled meats and spices. 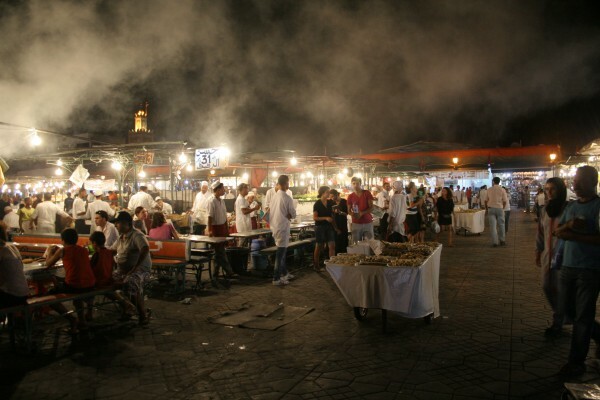 The area surrounding the market is of course home to the many souks, great for browsing and shopping after your meal. Every stand enlists an energetic young man to entice tourists and locals alike to eat at their booths, listing off the delicious food items they serve, leading you to their tables and setting you up as comfortably as possible. They do a great job at making it hard to say no. It was in the same way we came to stop by the busy Chez Khalil booth, numbered 75. 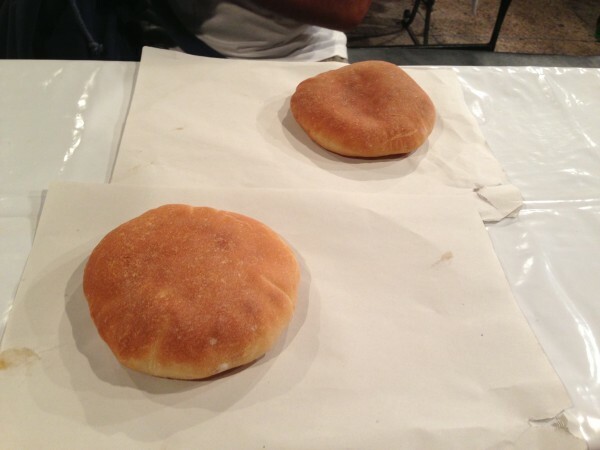 Starting us off with some freshly baked homemade bread and some spicy special sauce, we checked the menu and ordered a few things to taste. 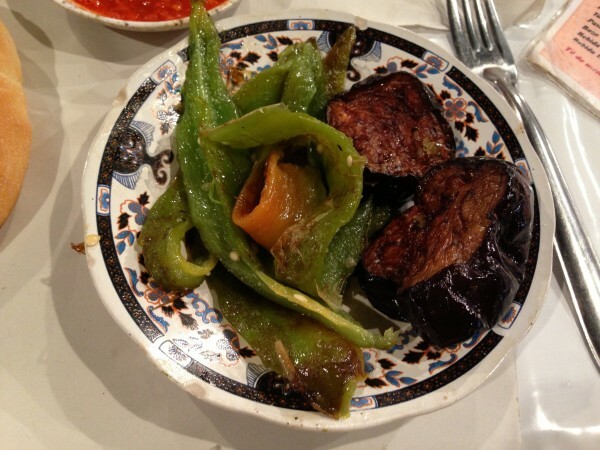 The grilled vegetables included eggplants, green and orange peppers. 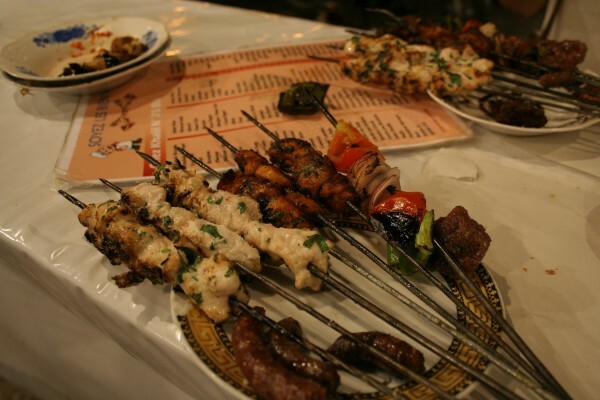 Almost everyone had a plate of grilled skewers so naturally, we had to get some too. We watched as the men behind the counter prepared the meats, spiced them and stuck them onto metal skewers. After a quick grill, we were served some very delicious, juicy pieces of chicken and beef. A couple of tomatoes and onions made an appearance as well. 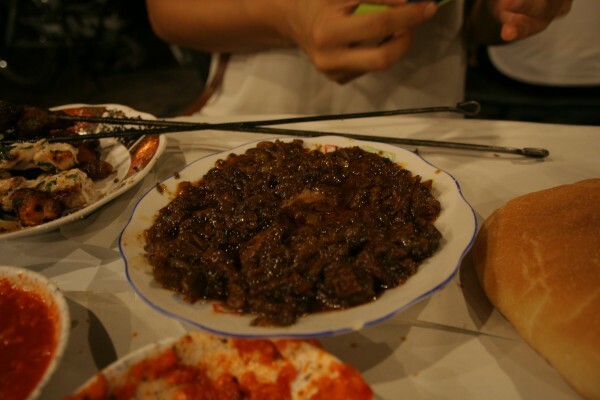 We also tried the spleen, a dish that seemed a bit more out of the ordinary. We weren’t sure what to expect, but for future notice, don’t expect too much. The spleen was served in a shallow bowl, steeped in a greasy broth. The pieces of spleen were soft and bland tasting, save for a bit of smoky charred flavour. We left this one on the table. Street food is always interesting, no matter where you travel. Marrakech is no different. 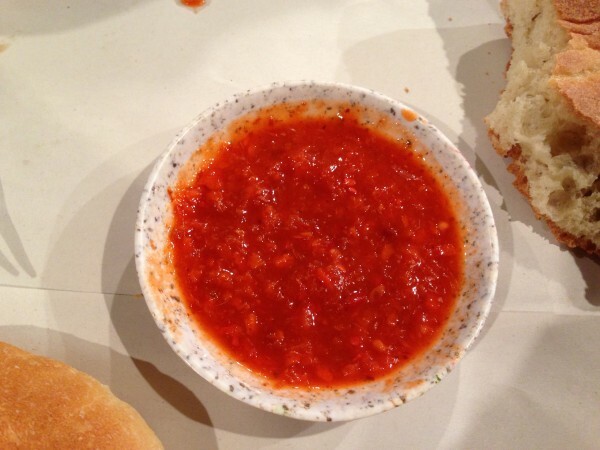 Definitely worth trying at least once during your stay in the city. 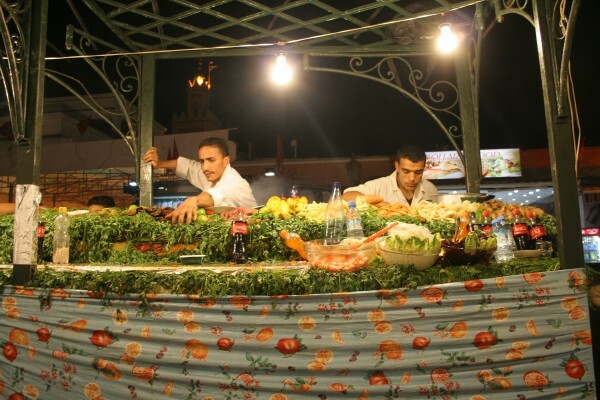 Tags: Grilled Meat, Jemaa El Fna, Market, Marrakech, Morocco, Snacks, Spleen, Street Food.